Organizational description: Land for the Homeless (L4H) is a 501(c)3 nonprofit organization incorporated in New Jersey for the purpose of providing land (and preferentially additional services) to allow the homeless to be able to peacefully cohabitate upon. Additionally, the organization will advocate for homeless rights as a whole. Specific concept: Crowdfund the purchase of land for the homeless to live upon. Provide basic shelter via tents and sleeping bags/apparatus (22 initially), portable toilets (2 initially), and showers in addition to supplemental health assistance and nutritional assistance utilizing the cooperation of outside allies. The organization will progressively expand homeless services based upon open availability of resources. Ideally, upon expansion the organization would also be able to aide in providing educational and job placement assistance. Adults who are without shelter, in need of shelter, or at risk of losing their homes. See Market Analysis for further information. Value proposition: Land for the Homeless offers immediate assistance for people who have nowhere else to turn. While shelters are becoming overcrowded and the homeless are forced onto waiting lists, there are people who have no other choice but to live on the streets. There is already a major issue with the criminalization of the homeless in America and this project will create a safe and worthwhile community for those needing assistance that is accomplished through the willing cooperation and altruism of conscientious individuals without suffering a cost to taxpayers. The idea behind Land for the Homeless came in response to the governmental closing of the Lakewood tent city. It was a travesty to see a community of otherwise peaceful people with nowhere else to go be kicked off of unused publicly owned land because they did not have the legal rights to build a community upon it. The response seemed to be inefficient as the government’s resulting relocation of the homeless to temporary motel-based housing did not alleviate the root issue behind homelessness which is the lack of a permanent place to call home. With traditional shelters across the state of New Jersey facing overcrowding, the logical solution to this problem is to invest in a private plot of land for which those in need of shelter can peacefully cohabitate upon and call home. Target client demographics: According to numbers provided by Monarch Housing Associates, there were an estimated 13,900 homeless persons across the state of New Jersey as of January 2014. Of these, 53.6% were male, 46.4% were female, and .02% were transgendered. 50.5% of these individuals were black or African American, 45.7% were white, 2.4% were multi-racial, and 1.31% identified as Asian, American Indian/Alaska Native, or Pacific Islander. With regard to ethnicity specifically, 20% of these people identified themselves as Hispanic. 29.5% of these individuals were children under 18 years old, 9.6% were between the ages of 18 and 24 years old, 15.8% were between the ages of 25 and 34, 14.1% were between the ages of 35 and 44, 18.3% were between the ages of 44 and 54, 10% were between the ages of 55 and 64, and 1.7% were 65 or older. Land for the Homeless plans to address the multifaceted issues of the homeless community. According to numbers provided by Monarch Housing Associates, more than 50% of homeless adults in New Jersey are disabled and disability applies to 40% of the total homeless population, including children under 18; The most reported disability is mental illness, with substance abuse and physical disability falling slightly behind; Approximately 7% of the homeless in New Jersey are veterans and 78.9% of these report having some kind of disability; 11.7% of all homeless households in New Jersey report having a victim of domestic violence. According to the National Health Care for the Homeless Council between 25% and 40% of homeless young adults (18-24) on a national level are LGBTQ; Homeless people are six times more likely to become ill than housed people. With an organization touting a mission so important to the community, maintaining a good public image and successfully reaching out to those seeking shelter is essential to the achievement of the organization’s purpose. Marketing concept: Land for the Homeless’ marketing concept will be centered around the wide range of people who can suffer from homelessness, breaking down the stigma of the term, and the importance of people helping other people. Presenting the fact that homelessness is suffered by such diverse groups of individuals goes to show potential donors that it’s an epidemic that anyone can become subject to, be it one’s own self or those who one cares about. It will also stand to maintain the dignity of all clients of the project. This informational marketing can also tie in fantastically with potential marketing segmentation. The resonating message that this project is about people helping people will leave that “feel good” feeling with potential donors and clients and will make them feel as though they are participating in an essential movement that is bigger than themselves. 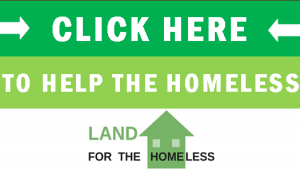 Land for the Homeless will promote its charitable efforts through its website, social media, online listings/digital campaigns, attendance at community events, hosting fundraising and awareness events, in-person donor canvassing, in-person homeless outreach, press releases, story placement, and interviews. Land for the Homeless will continually control its marketing efforts through the use of surveys and public perception analyses, and will make adjustments to these efforts whenever possible in order to optimize its overall marketing strategy. Organizational structure: The board of Trustees shall supervise the election and appointment of the ED, VED, Secretary, and Treasurer of the organization. The ED will manage all actions and personnel of the organization and delegate responsibilities, powers, and duties to other officers, employees, and volunteers when necessary. There shall additionally be an Advisory Council present within the organization whose purpose shall be to offer advice and suggestions from expertise in its committeepersons’ given fields for use by the organization and its management. All initial representatives of the organization shall be unpaid volunteers. There may be the potential for paid representatives and contractors for the company depending on the availability of excess funds and the value to the organization hiring/contracting would bring. All clients will be required to sign a contract that outlines their strict adherence to the organization/facility’s code of conduct and waives liability for any services provided by the Land for the Homeless. Clients will be able to access the assistance of L4H staff for any and all concerns or suggestions related to the facility, services, and issues relating to other clients. The management of the organization will exercise, through sound judgment, the best course of action in the event of any conflict that may arise in serving its clients. A secure on-site administration center will be essential for the proper maintenance of the facility. This administration center will require desks, chairs, radios, computers, and printers in order to properly serve the organization’s client base. Additionally, outside offices may be required for proper organizational governance. Crowdfunding for the cost of land purchase and any initial startup costs which fail to be met by the direct donation of desired items or services, direct in-person donation solicitation, holding fundraising events, donations via website, partners and affiliates such as Amazon Smile, grants, and institutional donations. Management of funds: The treasurer of the organization shall manage and keep track of all funds. All expenses must be approved by the Executive Director, the Vice Executive Director in the Executive Director’s absence, or the Treasurer and any designees or committees properly authorized by these officers. From time to time the Trustees, Officers, or the Advisory Council may launch a review into the operations of the organization and outline recommended changes to improve the quality of service that Land for the Homeless provides. The Key Performance Indicators above will be used as metrics for these reviews. There will be an internal review completed at least once every 6 months. 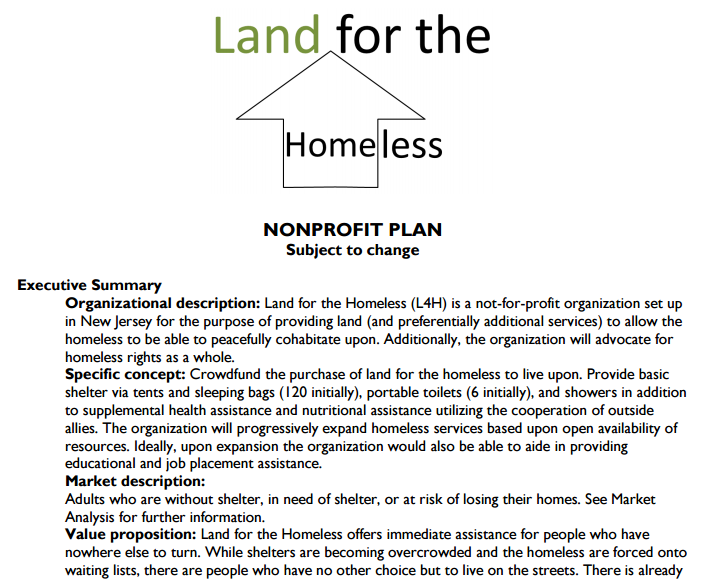 Organizational description: Land for the Homeless (L4H) is a not-for-profit organization set up in New Jersey for the purpose of providing land (and preferentially additional services) to allow the homeless to be able to peacefully cohabitate upon. Additionally, the organization will advocate for homeless rights as a whole. Specific concept: Crowdfund the purchase of land for the homeless to live upon. Provide basic shelter via tents and sleeping bags (120 initially), portable toilets (6 initially), and showers in addition to supplemental health assistance and nutritional assistance utilizing the cooperation of outside allies. The organization will progressively expand homeless services based upon open availability of resources. Ideally, upon expansion the organization would also be able to aide in providing educational and job placement assistance. According to numbers provided by Monarch Housing Associates, there were an estimated 13,900 homeless persons across the state of New Jersey as of January 2014. All clients will be required to sign a contract that outlines their strict conformance to the organization/camp’s code of conduct and waives liability for any services provided by the Land for the Homeless. Clients will be able to access the assistance of L4H staff for any and all concerns or suggestions related to the camp, services, and issues relating to other clients. The management of the organization will exercise, through sound judgment, the best course of action in the event of any conflict that may arise in serving its clients. A secure on-site administration center will be essential for the proper maintenance of the camp. This administration center will require desks, chairs, radios, computers, and printers in order to properly serve the organization’s client base. Additionally, outside offices may be required for proper organizational governance. Tax deductible status for donors and the waiver of the organization’s obligation to pay income and property taxes is dependent upon the successful obtainment of 501(c)3 status with the IRS. Crowdfunding for the cost of land purchase and any initial startup costs which fail to be mitigated by the direct donation of desired item(s) or service(s), direct in-person donation solicitation, donations via website, partners such as Amazon Smile, grants, and institutional donations.